Future of the series: The next book in the series is entitled The Alchemist of Lost Souls with an expected release date of May 1, 2019. Up to this point I have focused on reviewing thrillers that take place either in the present day or in the future. The main reason for that is my blog focuses primarily on thrillers that have some basis in science and technology. The era of modern science has resulted in a vast explosion of scientific discoveries, but what we know as modern science has only been around for the last two hundred years. Before this time, science was muddled in with philosophy and religion and wasn’t considered to be a part of the societal norm. Even though early scientific concepts may have not been generally accepted by society, scientific inquiry has been occurring since ancient times. Modern science as we know it would not be possible if it weren’t for the brave scientists of yesteryear that built its foundation. So this brings me to Mary Lawrence’s Bianca Goddard series which occurs during the time period of mid sixteenth century Tudor London where superstition usually superseded scientific fact. Lawrence’s series focuses on alchemy and herbalism which both are stepping stones towards modern chemistry and medicine. Alchemy had been around since ancient times and was a practice in quest of the ‘philosopher’s stone’ that could convert common base metals into noble metals such as silver and gold or partake in the development of the elixir of immortality. 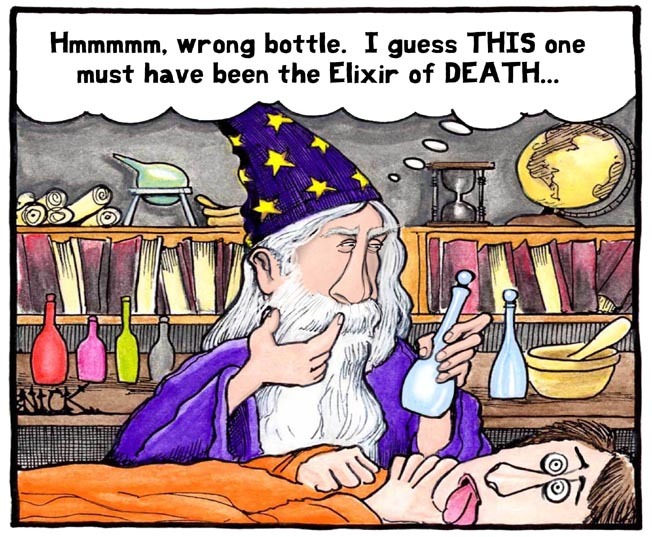 Though no alchemist ever found the philosopher’s stone or concocted the elixir of life, they did, however, contribute greatly to the field of chemistry. Many of the laboratory practices that are seen in modern chemical laboratories were first developed by alchemist, such as distillation, purification, and extractions. A number of notable scientists began their careers as alchemist, such as Robert Boyle, often referred to as the father of modern chemistry, and Isaac Newton, one of the most brilliant scientist of all times. Bianca Goddard, the daughter of an alchemist, practices herbalism and refers to herself as a chemiste. Goddard has the persona of a scientist as she often has tunnel vision when it comes to solving a problem which means that the man of her life, John, often gets second billing. Goddard’s world is not a pretty one and Lawrence’s graphic portrayal of the slums of Tudor London may not be for those with a weak stomach as disease, pestilence, and lack of sanitation was the norm. The first book in the series, The Alchemist’s Daughter, is a medieval rendition of Willard, and if you have a phobia of rats, you will be checking into a mental institution after reading this one. If you like historical fiction that reads much like a medical mystery, then I am sure that you will find Mary Lawrence’s Bianca Goddard series quite entertaining. Though it didn’t quite have the thrills that I normally like to see, the novels do have an intriguing storyline and the series is a refreshing change from the usual thrillers that I read. Both The Alchemist’s Daughter and Death of an Alchemist could easily be read as standalones. Most Favorite Novel in the Series- The Alchemist’s Daughter, call me weird, but I rather liked the rat theme. What about the science? I am not an expert on alchemy or the science of 1543, so it would be impractical to give my opinion on the subject. But Mary Lawrence is a cytotechnologist which means she has a good understanding of modern science, and she is also has an avid fascination in the history of Tudor England. The Bianca Goddard Technical Word in Review: Sudor anglicus-also known as the ‘Sweating English Sickness’, resulted in five epidemics during the years 1485, 1508, 1517, 1528, and 1551. The mortality rate was thought to range from 30% to as high as 90%. The disease progressed rapidly starting with chills and tremors followed by a high fever and weakness. The most serious of symptoms was profuse sweating and difficulties in breathing. Scholars also believed that a similar disease occurred in France which was known as the ‘Picardy Sweat’. The Picardy Sweat differed to the Sweating English Sickness in that a rash was prominent in the French victims but did not occur in the English. The cause of sudor anglicus has been a mystery, however, there are some scholars that believe that the disease may have been as a result of a hantavirus. Hantaviruses are carried by rodents and the virus is transmitted to humans through inhalation of aerosolized particles of rodent feces or urine and Tudor England had its fair share of rodents. Proving that a hantavirus was the cause of the disease may prove to be difficult as the hantavirus is a RNA virus and RNA is considerably more fragile than DNA. This means that any tissue samples from victims during that era may not provide any concrete evidence and sudor anglicus will continue to remain a mystery. Imagine a time when the good king’s ship the Mary Rose moors within sight of His Majesty’s Whitehall residence, its four masts reaching skyward like trees sprouting on the Thames. In the year 1543 of King Henry VIII’s turbulent reign, the daughter of a notorious alchemist finds herself suspected of cold-blooded murder. To clear her name and keep her neck free of the gallows, Bianca must apply her knowledge of the healing arts to deduce exactly how her friend was murdered and by whom—before she herself falls victim to a similar fate. . . . He refused to take it. “I’ll not pour acid in my palm,” he said. “You are the daughter of an alchemist. You invert it. Wynders had no idea how she resented being referred to as an alchemist’s daughter. Bianca turned the flagon upside down over her hand. Nothing. Not even a dribble of liquid fell out. It was not the plague. In the mid sixteenth century, Henry VIII sits on the throne, and Bianca Goddard tends to the sick and suffering in London’s slums, where disease can take a life as quickly as murder. . . .
For years, alchemist Ferris Stannum has devoted himself to developing the Elixir of Life, the reputed serum of immortality. Having tested his remedy successfully on an animal, Stannum intends to send his alchemy journal to a colleague in Cairo for confirmation. But the next day his body is found and his journal is gone. Bianca, the daughter of an alchemist, is well acquainted with the mystical healing arts. When her husband John falls ill with the sweating sickness, she dares to hope Stannum’s journal could contain the secret to his recovery. But first she must solve the alchemist’s murder. As she ventures into a world of treachery and deceit, Stannum’s death is only the first in a series of murders—and Bianca’s quest becomes a matter of life and death, not only for her husband, but for herself. . . .
She would touch the moon. During the tempestuous reign of Henry VIII, London alchemist Bianca Goddard has seen up close what keeps a man alive and what can kill him. A good thing, for she will need all her knowledge to keep a friend away from the gallows . . .
Tragedy strikes again at the couple’s reception, when Odile suddenly drops dead in the middle of the wedding feast. The constable suspects Boisvert poisoned his new bride for her money, but there’s not a trace of poison in her food or wine. Could the two deaths be connected? To prove their friend s innocence, Bianca will need to employ her knowledge of alchemy for if she can determine how the bride was killed, she may find the person responsible for her murder before another victim is added to the death toll . . .
“She’s dead, Boisvert, said Oro Tand, standing over them. He looked ten feet tall as he gazed down his nose at them. There was no expression of emotion in his words. They fell flat as the floor. The master of the Goldsmiths’ Company took the matter into his hands. He sent for the authorities, assuaged distressed goldsmiths and their distraught wives. The kitchen ceased operations. When the ward constable and coroner arrived, Tand escorted the men into the dining hall. Bianca was relieved that her nemesis, Constable Patch, had not been summoned. It was the same man who had investigated the death at St. Vedast a few days before. Many series are being made into movies or television programs. If you are like me, you probably imagine who you would like to play the lead role. So who would you pick to play Bianca Goddard? My choice would be Keira Knightly.